Citadel Hill has been home to four different forts in its life, with the first being establish in 1749 which was the same year for the town of Halifax. The fort was in a very strategically important place as it was to protect the Royal navy dockyard and port of Halifax, though in all of its years of having four different forts atop its peak, it never saw any combat. It was still quite important as a base of operations and played an important part in the various conflict's of the area. The first fort was little more than a palisade wall with a couple of guard towers, but it was still never directly attacked. The surrounding area was not quite so lucky, with Indians raiding the town of Halifax 12 times in all, causing many deaths. The next fort was built in 1776 during the revolutionary war and consisted of a more permanent design. Earthen banks and cannon emplacements overlooked the whole area, though again it was never attacked. The third fort was completed in 1800 and included lowering the whole top of the hill by around 10 meters to accommodate a larger defensive outline. But during the war of 1812 it was constantly protected by the British navy who had superiority in the area. 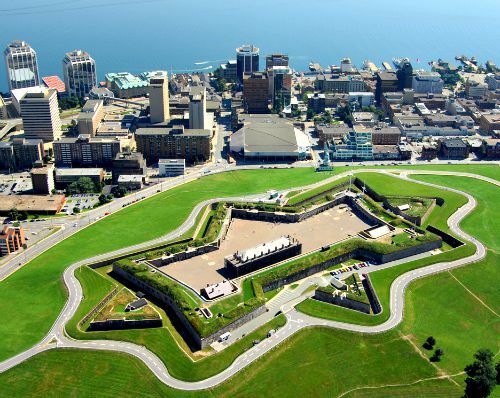 The current structure atop Citadel hill is known as Fort George and took 28 years to build. It was finally finished in 1856 with a new design to withstand cannon fire and be a more comfortable place to be stationed, But again it was never attacked. Today the fort is in the top five most visited National Historic Sites in Canada, and is open to the public all year round. Citadel Hill is considered by many as the most haunted historic site in all of Canada, and has one of the highest rates of reports for ghostly encounters. The most commonly reported ghostly experience is by far apparitions. Everything from Indian warriors to world war 2 soldiers have been seen here, often just walking along a particular area and going into a room before vanishing. One story that keeps coming up is from the visitors to the fort who take part in the ghost walks. A little girl has been known to tag along at the back of the crowd, walking behind everyone as if to shy to join the group. People in the ghost walks have even claimed the girl to grab their hands as if wanting to hold them. Other reports of activity within the fort are endless, with everything from disembodied voices and sudden gusts of wind in closed rooms, to unexplainable knocks and bangs and even physical contact such as being shoved or barged past.